Welcome, and thank you for visiting us! 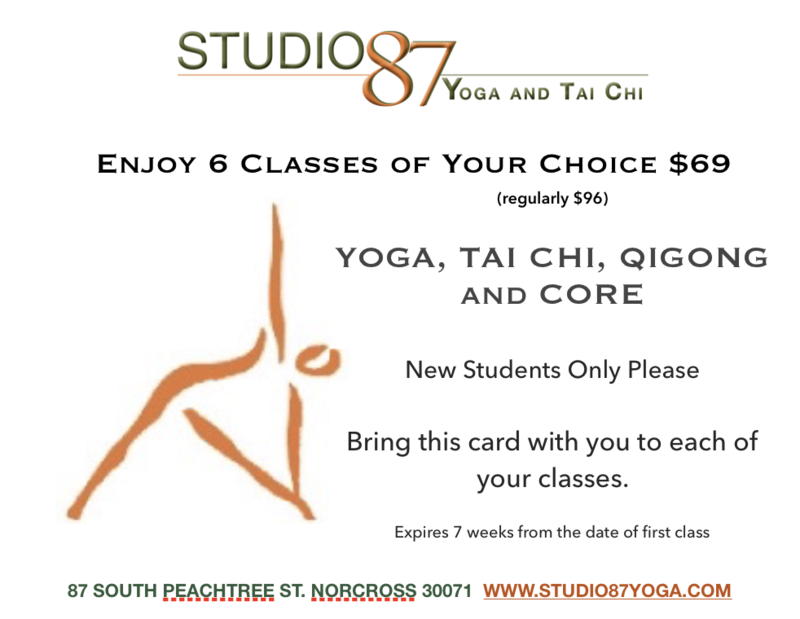 We are an Iyengar Yoga Studio offering daily classes in beautiful downtown Old Norcross. We offer two weekly Chen-style Tai Chi classes, Qigong, Functional Core and Bendi-Buddies Grounded-Kids Yoga. We schedule workshop events with senior yoga and tai chi teachers and offer focus classes year round. If you have any questions after browsing the site, please contact us! Private classes are discussed and scheduled between the teacher, student, and the studio owner prior to setting appointments. Studio 87 is ready to assist you! I like to say, "Yoga changed my life!" After a cancer diagnosis, it became clear that I needed to focus more on my physical, emotional and spiritual health. Iyengar yoga, and especially, Donna and Studio 87 gave me that opportunity. My daughters have attended the Grounded Kids Yoga for several years and absolutely love the class! Ms. Marsha is just terrific with the children and makes instruction fun and enjoyable for children of all ages. I have noticed a drastic improvement in concentration and ability to focus on tasks in both girls since they have been taking this class. Sit at a computer most of the day? I do and the result isn’t good. 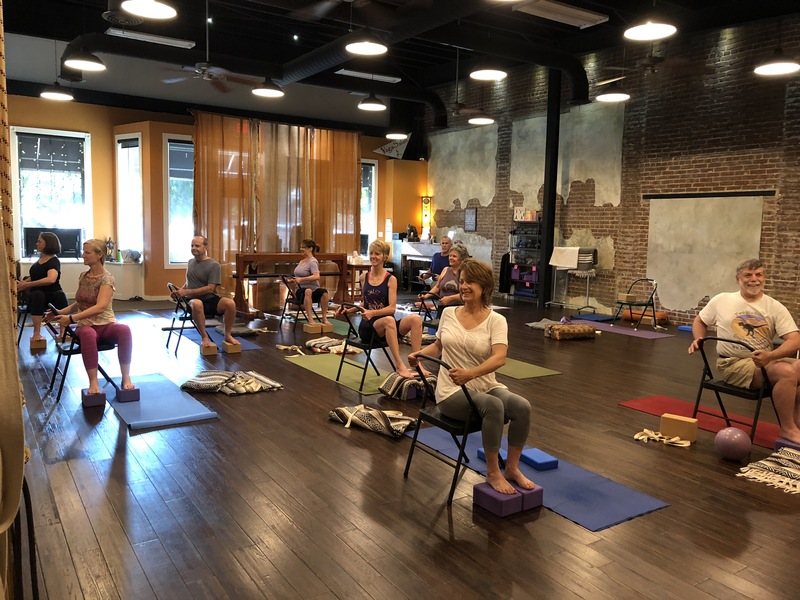 The core and ball rolling classes are great for reversing the tight muscles, the “hunching” posture, and the foreshortened muscles that come with life in front of the screen. Thanks to Studio 87 classes, I’m standing taller, I’m stronger, and I rarely reach for the aspirin these days. Classes help me keep my weight down, too. I consider my decision to take a class at Studio 87 to be one of the best I’ve ever made. The first thing I fell in love with was the Iyengar style of practice. This approach to yoga allowed me to begin learning about the structure of the poses and form a deep appreciation for yoga as a practice. Upon moving to the metro-Atlanta area, I had almost 12 years of yoga under my belt. When I first attended one of Donna's classes nearly five years ago, I thought the practice would be similar. It wasn't. I learned what Iyengar yoga was very quickly and it was just what I needed. Studio 87 has been a place of respite for me, offering space and time for me to look inward and calm and soothe my body, mind and spirit. Iyengar yoga has become an integral part of my life. When you find a form of exercise that your body needs as much as food and water, then you know you are on to something. This is how I feel about yoga and Studio 87! Donna, Christy, and Steve have all had a profound impact on my wellbeing.